"Evicted" redirects here. For the non-fiction book, see Evicted: Poverty and Profit in the American City. Depending on the laws of the jurisdiction, eviction may also be known as unlawful detainer, summary possession, summary dispossess, summary process, forcible detainer, ejectment, and repossession, among other terms. Nevertheless, the term eviction is the most commonly used in communications between the landlord and tenant. Depending on the jurisdiction involved, before a tenant can be evicted, a landlord must win an eviction lawsuit or prevail in another step in the legal process. 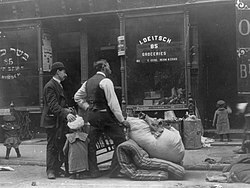 It should be borne in mind that eviction, as with ejectment and certain other related terms, has precise meanings only in certain historical contexts (e.g., under the English common law of past centuries), or with respect to specific jurisdictions. In present-day practice and procedure, there has come to be a wide variation in the content of these terms from jurisdiction to jurisdiction. The legal aspects, procedures, and provisions for eviction, by whatever name, vary even between countries or states with similar legal structures. Most jurisdictions do not permit the landlord to evict a tenant without first taking legal action to do so (commonly referred to as a "self-help" eviction; such actions include changing locks, removing items from the premises, or terminating utility services). Such evictions are generally illegal at any time during the process (including after a landlord wins an eviction suit); a tenant facing such measures may sue the landlord. However, self-help evictions may be permitted in some jurisdictions when commercial tenants are involved, as opposed to residential tenants. Prior to filing a suit in court for eviction, generally the landlord must provide written notice to the tenant (commonly called a notice to quit or notice to vacate). If the tenant remains in possession of the property after the notice to vacate has expired, the landlord can then serve the tenant with a lawsuit. Depending on the jurisdiction, the tenant may be required to submit a written response by a specified date, after which time another date is set for the trial. Other jurisdictions may simply require the tenant to appear in court on a specified date. Eviction cases are often expedited since the issue is time-sensitive (the landlord loses rental income while the tenant remains in possession). A jury trial may be requested by either party, however until the late 2000s that was very uncommon. As mentioned above, most jurisdictions do not allow a landlord to evict a tenant without legal action being taken first, even if the landlord is successful in court. Instead, the landlord would have to obtain a writ of possession from the court and present it to the appropriate law enforcement officer. The officer then posts a notice for the tenant on the property that the officer will remove the tenant and any other people on the property, though some jurisdictions will not enforce the writ if, on that day, inclement weather is taking place. As gentrification and the re-population of urban centers by wealthier residents takes place, no-fault evictions are used as a tool to displace tenants in cities with rent control. In California, for example, the Ellis Act allows eviction of rent-controlled tenants if the landlord intends to no longer rent any portion of an apartment building (i.e., landlords cannot be compelled to rent). The Ellis Act has been applied to rentals in San Francisco, Santa Monica and Los Angeles. In the United States of America, rules for evictions and the eviction process are ruled by each state, local county, and city rules. ^ Aron, Hillel (2014-12-10). "How "Superman of Renters" Daniel Bramzon Revolutionized L.A.'s Eviction-Defense Industry". L.A. Weekly. Retrieved 2016-10-07. ^ "Eviction". Texas Tenant Advisor. Austin, Texas: Texas Low Income Housing Information Service. Retrieved 2019-02-27. If it is raining, sleeting, or snowing you cannot be removed. ^ "Ellis Act Evictions, San Francisco". Anti-Eviction Mapping Project. San Francisco, California. Retrieved 2019-02-27. ^ "2015 Promises to Be a Battleground Year for Ellis Act Evictions". The Bold Italic. A Medium Corporation. 22 January 2015. Retrieved 4 April 2018. ^ "Seattle Municipal Code, section 22.206.160 - Duties of owners". Municipal Code Corporation. Retrieved 2019-02-27. 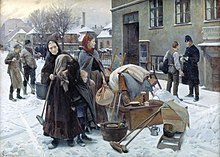 Look up eviction in Wiktionary, the free dictionary.